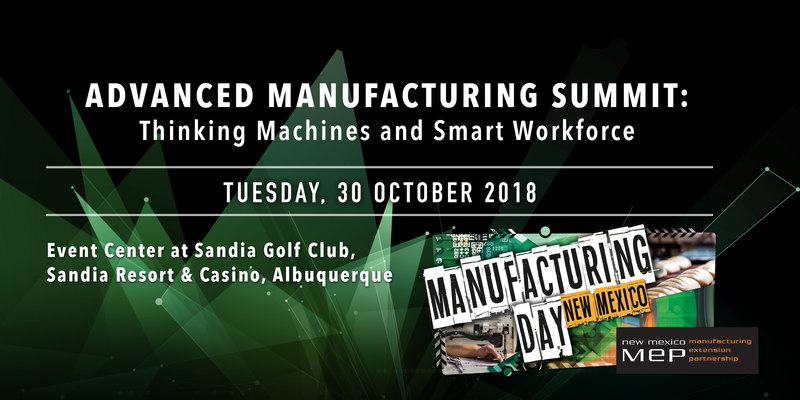 New Mexico MEP’s annual summit is a networking and think-tank opportunity for manufacturers, economic developers and thought leaders to discuss current issues affecting manufacturers in New Mexico. Typically held the last week of October, the event serves as the celebratory culmination of Manufacturing Day activities that take place throughout the month. Details about the 2019 Summit will be posted here as they become available. Meanwhile, here’s what happened in 2018. 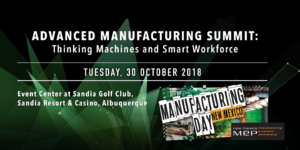 Some 150 people converged at The Events Center at Sandia Golf Club, Sandia Resort and Casino in Albuquerque on Tuesday, October 30 to discuss topics that ranged from cyber security to commercial opportunities in space. There were panel discussions, break-out sessions, case studies and motivational speakers, with plenty of time for networking over lunch and an evening reception. Keynote presentations put a spotlight on commercial opportunities in space and the digital transformation occurring in the manufacturing industry, including adoption of augmented reality and artificial intelligence. Industry 4.0 — What’s Happening? Thomas A. Fitzgerald is a member of the Senior Executive Service. He is the Director, Engineering, Space and Missile Systems Center, Air Force Space Command, Los Angeles Air Force Base, Calif. Mr Fitzgerald leads a team of military, government civilian and contractors who are responsible to the SMC Commander for the quality of all engineering, technical, architecting, test and evaluation, and mission assurance activities for military space and missile programs. He provides the Center Commander, Program Offices, Program Executive Officers and external customers with engineering support in the form of manpower, policy, processes, tools and advice. He is responsible for organizing, training, equipping and providing policy and mentorship for military and civilian space and missile engineers and information protection personnel executing $8 billion annually. He provides oversight of the system and traditional engineering activities for SMC in close collaboration with other National Security Space stakeholders and his peers throughout OSD, the Air Force Secretariat, Air Force Space Command and Air Force Materials Command. Paul Boris has driven digital transformation within industrial and field operations for decades. He has served as Vice President of Manufacturing Industries at General Electric and Chief Operating Officer at Vuzix, a leading supplier of smart glasses, augmented reality and virtual reality technologies. Boris maintains that Industry X.0 requires leveraging a complex set of technologies and strategies. From Cloud and Edge Computing to Wearables and Augmented Reality (AR) to tools like Machine Learning (ML) and Artificial Intelligence (AI), Boris has focused on delivering differentiated solutions to manufacturing and field service operations, with an intense focus on creating sustainable and scalable value. In the spring of 2018 he launched #AR for Industry to help companies deliver the greatest impact in the shortest cycle. OTHER SPEAKERS included Jennifer Kurtz, PMP, Cyber Program Director; Dean L. Schneider, Co-Director, Southern Regional Manufacturing Center; Chris Ziomek, entrepreneur and CEO of Build with Robots; Nick Justice, Executive Director, PowerAmerica; Rebecca Hartley, Chief Workforce Officer Advanced Robotics for Manufacturing (ARM); and Bill Basso and Gaelan de Wolf, Managing Partners at OsteoStrong.